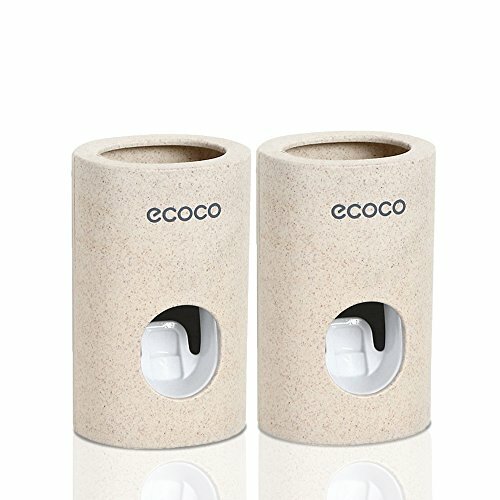 This unique Automatic Toothpaste Dispenser is designed for your convenience, Hygienic and Economy. Freely control the amount of toothpaste, easily and quickly, and also avoid wasting your money. For the first use, keep the walls dry and clean. After the toothpaste dispenser is glued,wait 24 hours to fully secure it to the wall. Come on!Your washroom need one? 1.Install inside your cabinet or the dry cleaned mirror, tile or cabinet. 2.When you push the system to dispense the paste when you release, pls hold your brush in the dispenser for a couple of seconds so the paste finishes dispensing on your brush and not all over the system. Get this dispenser, much more convenience your family shall enjoy! Non-contact operation and free hand squeeze to get toothpaste, compared with the other, this toothpaste dispenser to get more accurater and stabler toothpaste, adults and children are very suitable to use.Allows your kids the ability to dispense the toothpaste themselves, without making a mess. The connection is set with a magnet, you can easily remove the lid to replace the toothpaste and clean-up, when the cover is installed, will not automatically fall. Our toothpaste dispensers are made from the highest quality ABS plastic and wheat straw material, which is both reliable and durable, you can safely use. automatic toothpaste dispenser adopts vacuum technology , pump out last drop of toothpaste and avoid direct touch,Stay economical and hygienic. Wonderful bathroom accessories to stay away clutter and bacteria. Cool lifestyle trend encourages you to live better. If you have any questions about this product by Reabeam, contact us by completing and submitting the form below. If you are looking for a specif part number, please include it with your message.